The key to any good social media profile is consistency. You should be aiming to post on your chosen social media channel(s) at least once per day. How the heck am I going to do that, you ask? A content calendar will ensure that you drastically minimise time spent procrastinating over what to post. Reduced procrastination means you will more likely post regularly, because if instead of racking your brain for 30 minutes deciding on a topic, or forgetting what you were doing while scrolling through your social media feeds for inspiration, you will know straight away, what theme or type of post you are doing. Decision made. Compose Post. Publish. As a digital marketing company, we see a lot of people who say they don't know what to post on social media, feel like they are wasting their time and feel like they are failing to market their business or themselves well. And you know what? You probably are wasting too much time through being inefficient on social media. Your time could be better spent working ON your business. So if you don't have a social media content calendar, you can get our 365 Day Content Calendar right here. And the best bit? It's less than $50. Bargain! So now that you have your content calendar organised, what should you be posting on social media? Drive traffic to your website, the hub of your marketing activity. Getting people to visit your website gives you the best chance of selling yourself, services or products. It helps reinforce your brand, removes social media distractions and, more traffic on your website means better Google ranking. Promotion comes with a quick word of warning; you want to sprinkle promotional posts amongst other eye-catching or engaging content. Otherwise, you'll come across as too 'salesy', and you'll likely find it hard to grow your social media audience. Share a recent blog or share an older blog that received a lot of comment, likes or engagement. Share links to your products and services touting the problem(s) that they solve. What's a common question you get asked? Provide the answer and link to the product or service on your website that solves the problem. Do you have videos that showcase your products, services or company? Share them on social media. If you don't have videos, challenge yourself to start recording little videos using your smartphone. They need not be more than 30 seconds. A quick introduction to your company, or an overview of a product or service, or answer an FAQ. Videos get much higher levels of engagement. Photos or video of you and your team (if you have one), give your audience a behind-the-scenes look at your business. Share old photos of your company, yourself or founders. After a big sale or finishing a project, ask your client for a testimony. Share the testimonial along with your client's logo and tag them (with their permission). Social proof of others using your services or products assists with others who are still in the consideration phase of the buyer's journey. Once you finish a large project or deliverable, write a problem-oriented case study and publish it on your website. Talk about the problem your client was facing before purchasing your products or services. Discuss their specific pain points; it will help potential purchasers have an 'A-ha! I have the same problem' moment, which is essential for them to decide you are the person who can solve their problem. Share the story of the product or service delivery. How easy was it for the client? Was it delivered on time? Did it meet the budget? What was the outcome? Try and share specific, quantifiable results such as x% increased productivity or $y saved. Finally, close out with the testimonial from the client and if possible images of the completed project. Share photos that show the effectiveness of your products or services. The contrast often gets a strong reaction from an audience and allows you to more subtly show what you can do to help your target audience. Share an attractive discount (perhaps with a coupon code) that is available only to your social media followers for a limited time. If you offer specials on a consistent schedule (e.g. monthly), create a recurring calendar appointment to remind you to develop the offer before it's due. Share a photo of yourself or a team member with a brief bio. Tease your followers with a hot question, offer or tip that is in your current newsletter and tell them to sign up to find out more. Showing appreciation, gratitude and recommending other businesses, people, products and services demonstrates that you're a great person or company to work with. It shows your kind nature and abundance mentality. Who can you give a for? A supplier, a local business, your favourite coffee shop/gym/hairdresser/business coach/the list goes on. Take note of when you receive exceptional service, or something more than expected and give a heartfelt testimonial to that person or business, tag them and encourage people to follow them. Questions are a great way to engage your audience. Post questions with an eye-catching image, meme or even animated gifs. A quick Google search for 'Questions to increase social media engagement' will provide you with plenty of content to assess. Get our editable social media templates, including 16 questions designed to spark engagement. Polls usually attract higher engagement. Ask your audience for their preference. Use it as a way to gather information for future products or services. Encourage your followers to unplug from work and their devices, to disconnect to connect and be in the moment. Share a photo showing how you like to unwind. What are you reading at the moment? It doesn't have to be a book; it could be an article. Ask what your audience is reading. Sharing tips, content and opinions on current trends or news in your industry will help cement you as an authority on a topic and develop trust. Developing trust with potential clients is a big hurdle to overcome and a significant step forward in the buyer's journey. Share articles from your industry that your audience might be interested in or that may have an impact on your ideal clients. Add your opinion and direct people to contact you to discuss the topic further. Share tips on how you save time. You efficiency allows clients to save money or have results faster. It lets you show that you have the skills and experience to deliver results. Discuss your strategy for successfully delivering results to your clients; It allows you to show your efficiency and goal-oriented work habits. What do you use to get the job done? Share it with your followers - and check if there is an affiliate program. You could get paid for referring people. Ask your audience a trivia question on your industry, business or trends. Share advice on how people can save money in your industry. For example, in web design, if a client brings us a completed website brief for quoting, it can save time and therefore money. Show what you do on a Friday afternoon or Sunday night to be organised for the coming week. It puts you in a professional light and can help motivate your audience. So often social media can be a place for complaint and negativity, Being optimistic, inspiring and grateful shows you in a positive light. Share your favourite inspiring quote. 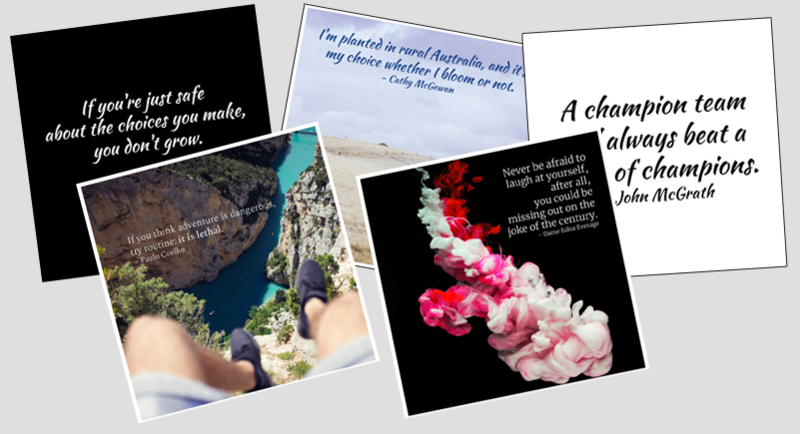 Design the quote in a visual app, like Canva. 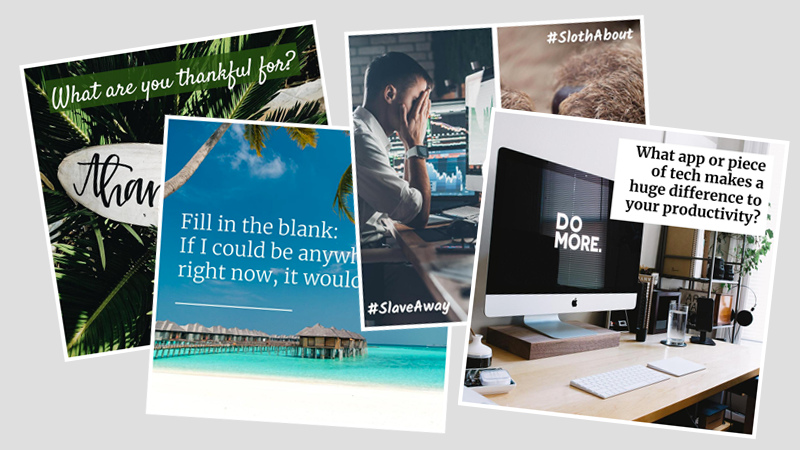 If you don't have time to do this yourself, get our 160+ editable social media images and save hours! 27. What are you grateful for? Share a picture of a person or thing that brings you joy. Share a tip on how you motivate yourself. Ask your followers for their suggestions. Share a tip on how you spark creativity, or what sparked creativity in the past. Ask your audience for their advice on how to find that creative spark. Suggest other inspirational or amusing accounts to follow and tag or @ mention them. Are there particular days in your industry that can be promoted and celebrated? 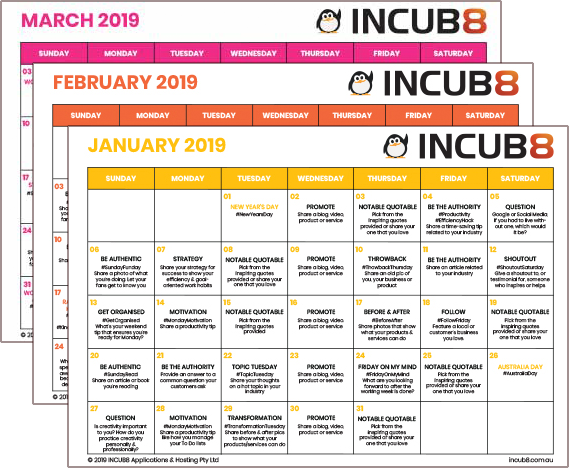 For INCUB8, we have dates to do with social media and tech added to our calendar - like Facebook's birthday and World Back Up. 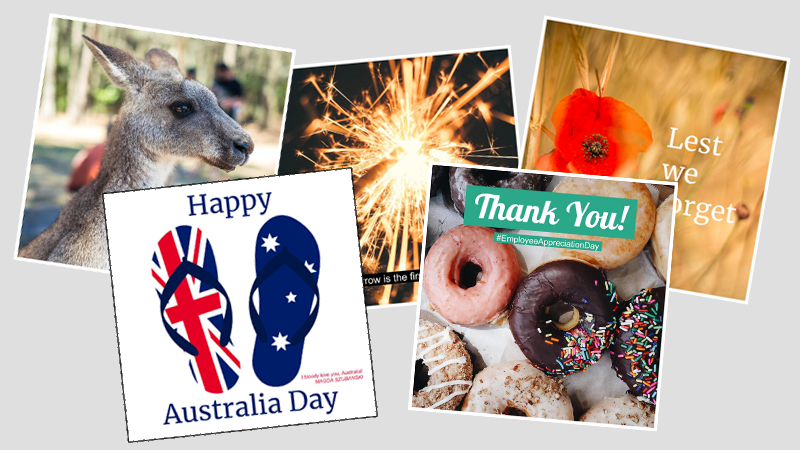 In Australia, days like RUOK? Day and Red Nose Day are popular.